Set high enough to allow for long-distance views of the Pacific Ocean, this home in Newport Beach takes in dramatic views from multiple outdoor areas. Located in the last section of the luxury Crystal Cove neighborhood, the 27-unit Coral Crest enclave from The New Home Co. opened last June. Coral Crest’s classic Mediterranean, Italianate and Santa Barbara architecture incorporates modern and sophisticated design elements ideal for gathering and entertaining. The homes range from 4,962 to 7,318 square feet of living space with up to six bedrooms and six and one-half baths. Prices begin in the $5 millions. Designed in a contemporary Mediterranean style, with the low-pitched, clay-tile roofs, Plan 3 by Robert Hidey Architects is sheathed in smooth plaster and rustic stone. 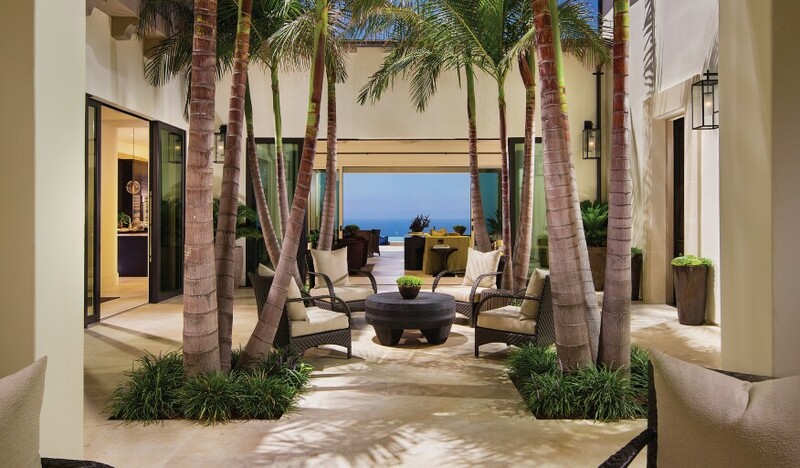 The entry sequence provides seamless views of the Pacific, from the entry breezeway, through the covered loggia and a large furnished courtyard, across the great room, a second loggia, and finally across a crescent-shaped infinity pool to the Pacific. Designed for a large family, the house has a number of ancillary spaces indoors and outdoors for public entertaining and for more intimate family time, including three furnished covered loggias, a flex room adjacent to the great room that is modeled as a media room, and an office/den on the first floor, and a bonus room on the second floor between the children’s bedrooms with a covered deck. The kitchen offers island seating, a breakfast nook and a formal dining room (with an optional wine room) and a secondary back kitchen for entertaining purposes that is standard with all models. The office/den may be combined with the front en suite bedroom on the first floor as a living suite for a multi-generational family member with a private front terrace entrance.